Just a few blocks away from Brightcove HQ in Cambridge resides Pegasystems, the leader in Business Process Management (BPM). Pegasystems provides software to drive revenue growth, productivity and agility for the world's most sophisticated organizations. Like so many B2B organizations today, Pegasystems understands the value of online video in building an online community around your brand. However, there are unique challenges associated with delivering high quality video experiences that resonate in the B2B world and help organizations like Pegasystems to drive customer engagement and overall awareness. 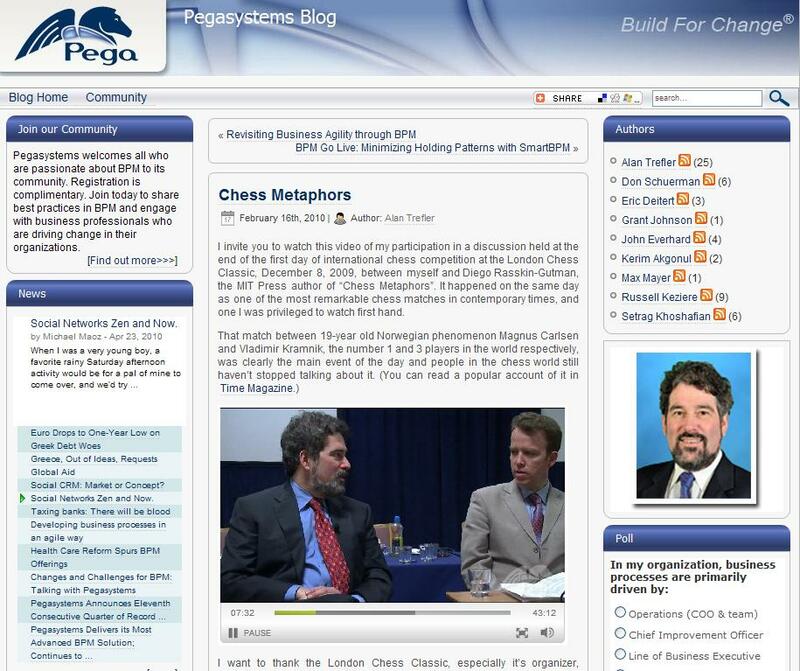 As a result, Pegasystems recently tapped the Brightcove platform to support a variety of new complementary video features on its corporate blog, as well as for the company's website, www.pega.com. Pegasystems has already built a substantial online community around BPM via its blog, but the addition of Brightcove-powered video to the blog provide readers with a more interactive, engaging experience. For example, for a recent product-related announcement the company opted to include a video of its vice president of BPM technology, Dr. Setrag Khoshafian, detailing the new features instead of a text-heavy blog post. Pegasystems is also leveraging Brightcove to post video footage of recent speaking engagements on its blog. On its corporate website, Pegasystems has introduced customer testimonial videos and other marketing-related video content on the Brightcove platform. The company plans to roll out a host of additional video content across its website in the future. Pegasystems is another great example of the many B2B organizations that are taking advantage of the market-leading innovations in the Brightcove platform to deliver high quality, branded online video experiences that drive results.